The Bishop of St Asaph has announced plans to take a sabbatical later this year. The Rt Revd Gregory Cameron, who will have been in post for ten years in April, will be away from St Asaph between July and November. 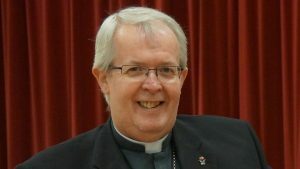 Bishop Gregory’s plans for his time of absence aren’t finalised yet but are likely to include time devoted to developing his spiritual life, relaxing with his family and studying, possibly in a theological college overseas. During the four-month break, the Dean of St Asaph Cathedral, the Very Reverend Nigel Williams, will become the senior priest in the Diocese. He, along with the Archdeacons who share the Bishop’s oversight, will carry out diocesan duties. Tasks specific to the role of Bishop will take place either before his sabbatical or on his return in November.